CARFAX 1-Owner. JUST REPRICED FROM $23,900, PRICED TO MOVE $1,400 below NADA Retail! ADD CLASS IV RECEIVER HITCH, PARKVIEW REAR BACK-UP CAMERA, Hitch, iPod/MP3 Input, Aluminum Wheels, POPULAR EQUIPMENT GROUP. 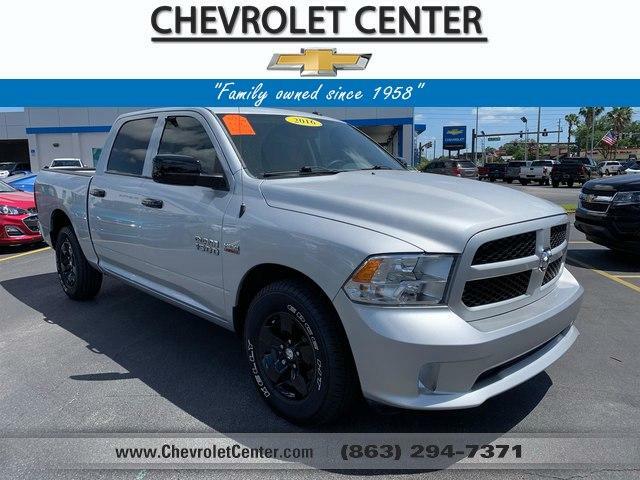 QUICK ORDER PACKAGE 26J EXPRESS Engine: 5.7L V8 HEMI MDS VVT, Transmission: 8-Speed Automatic (8HP70), Fog Lamps, Dual Rear Exhaust w/Bright Tips, Ram 1500 Express, Body Color Grille, Body Color Rear Bumper w/Step Pads, Front & Rear Floor Mats, Body Color Front Fascia, GVWR: 6,900 lbs, ENGINE: 5.7L V8 HEMI MDS VVT, POPULAR EQUIPMENT GROUP Remote Keyless Entry w/All-Secure, SIRIUSXM Satellite Radio, For More Info, Call 800-643-2112, No Satellite Coverage w/AK/HI, TRANSMISSION: 8-SPEED AUTOMATIC (8HP70), PARKVIEW REAR BACK-UP CAMERA Rear View Auto Dim Mirror w/Display, ANTI-SPIN DIFFERENTIAL REAR AXLE, ADD CLASS IV RECEIVER HITCH.